A special message to express our sincere appreciation for your choosing to work with us. Thank you for your confidence & loyalty. My dad raised 11 kids. He was the hardest working man I ever knew. After 37 years with AT&T, he retired. They put $1,00.00 down on a home in Fort Meyers FL. When he and Mom went to the closing, they found out that Fort Meyers did not have WGN on cable…He wouldn’t be able to watch his beloved Cubs. Well they lost that money and moved into a home in Naples, FL. They were happily enjoying their retirement when after a few months, Mom sent me a newspaper clipping from the local paper. There is a picture of Dad standing in front of a convenience store with a petition to take Naples Cable to court. They were planning to drop WGN. Dad got all the required signatures and the day before it was scheduled for court, they opted to keep WGN. You can still watch the Cubs there today. When Dad died in 1997, everyone wore Cubs jerseys & t-shirts to his funeral. Dad, I am thankful your Cubs FINALLY won the World Series! 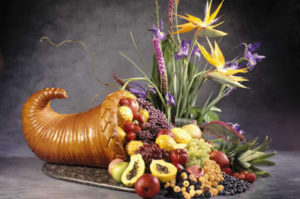 The turkey is the central element of many a Thanksgiving meal. An otherwise perfect meal can be ruined by a dry, overcooked turkey. Since this isn’t something we cook on a weekly basis, it’s not easy to pull off the perfect turkey…unless you follow these tips and the recipe below. Start with a quality turkey. Yes, you can find off brand turkeys for quite a bit less, but keep in mind that a lot of the pounds you will be paying for will be saltwater that was injected in the turkey. Go ahead and buy the good stuff – You’ll be glad you did when you get all the praises for that delicious bird you fixed. When you are ready to cook your turkey, remove the neck, giblets and anything else that may be stuffed in the chest cavity of your bird. Take some paper towels and pat your turkey dry. Set it in a large roasting pan. If you prefer the breast meat on the dry end, place the turkey on its back. For moister breast meat, turn the turkey breast down. Cut up a peeled onion, 3 stalks of celery and a few carrots. Big chunks are fine, since these vegetables are just for flavor. Stick them in the body cavity. They will infuse the bird with flavor as it cooks. Melt a cup of butter in the microwave. Use a turkey baster to baste the turkey with butter. Don’t use all of it, just enough to get your turkey covered. Sprinkle the turkey with salt, pepper and any other seasonings you like. Cook the turkey in a 325 degree oven. Baste it every 30 – 45 minutes with the juices that collect in the bottom of the roasting pan. 8 to 12 lbs. 2 ¾ to 3 hrs. 12 to 14 lbs. 3 to 3 ¾ hrs. 14 to 18 lbs. 3 ¾ to 4 ¼ hrs. 18 to 20 lbs. 4 ¼ to 4 ½ hrs. 20 to 24 lbs. 4 ½ to 5 hrs. Or cook until temperature on meat thermometer reaches 180 degrees (check in the thickest part, and in a couple different places) Don’t overcook or it will be dry, but do make sure it is done. How about an open faced sandwich? 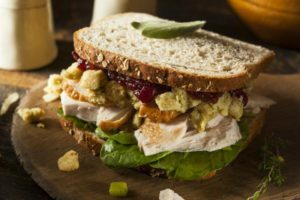 Instead of regular old sliced bread, make turkey sandwiches with fresh or ciabatta bread for a different taste. Start with some really good toast. Rub a little garlic or butter on it if you’d like. Then, lay slices of turkey on it and cover with gravy. Heat up some left over stuffing and stick it in the toaster oven or your regular oven to give it a nice little crust and tour sandwich is ready.